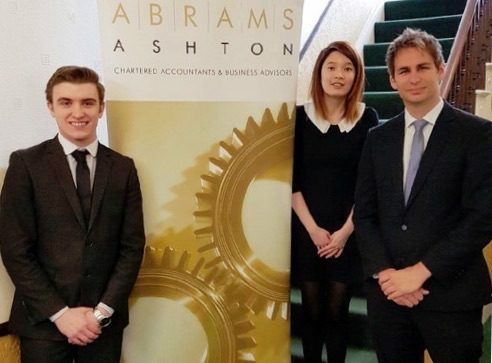 Accountancy and business advisors Abrams Ashton is reaping the benefits of investing in staff and skills after three of its trainee accountants passed their financial qualifications with flying colours. Nick Baxter, 31, from Bolton, recently achieved chartered certified accountant status. Having joined Abrams Ashton in 2014, Nick now takes up the position of client manager and will oversee a portfolio of SMEs from across the county. Tom Towers, 23, from Penwortham and Olivia Leigh, 28, from Leyland, also gained their AAT Level 4 qualifications from the Association of Accounting Technicians and are now turning their attention to progressing to chartered accountant level. After moving from China to the UK at aged 18 to study a degree in Finance & Accounting at Aberdeen University, Olivia joined the Chorley-based practice in 2014. Trainee accountant, Tom, also studied Accounting at Liverpool Hope University and has been with the firm since February 2015. Nick said: “Studying can be intense and demanding at times, but it’s definitely been worth it. “I actually fell into accounting, but soon knew it was the career for me. I moved to Florida at 20 to become a professional golfer, but it’s extremely competitive and came back to the UK after six months, went to university and gained a first-class honours degree in Business Studies and Finance. Abrams Ashton, added: “The trio’s achievements demonstrate that Lancashire possess top finance talent and reflect our commitment to investing in our staff.